Is this the gateway drug augmented reality headsets need? While there's a good variety to the VR headsets you can buy, from high-end options like the HTC Vive to middle-of-the-roaders like Gear VR and Google Daydream, and extremely affordable choices like Google Cardboard, AR doesn't currently enjoy the same variety. You can buy a developer version of HoloLens or enterprising-facing options from Epson and Vuzix, but that's kind of it. The only affordable way to experience AR is to use your smartphone. Mira is hoping to change that with its new $99 Prism headset, which can be best described as a Google Daydream or Gear VR for AR. You take your regular iPhone, slip it in, open up an app and off you go. We got a chance to try out the new headset and even play a couple games, so what's it like to use? Prism looks like a headband with two big lenses attached to the front, making it difficult to figure out where the hell you put your smartphone. Turns out, it's in the bill of the headband. You simply slip your regular iPhone 6 or 7 into that area, display out. That's it. No opening compartments or squishing it into a small area. From there you just open up Mira's app to dive into some augmented reality. I was given two demos, the first of which was an Asteroids-type game. The Prism is bundled with a touch remote not dissimilar from the remotes bundled with the Gear VR and Daydream. I used that to navigate my little rocket ship around some planets and asteroids, and not just vertically and horizontally; I could make the ship fly into the distance and come back again. The field of view, by the way, is about double that of Microsoft HoloLens. Bad guys with angry faces soon started attacking my rocket ship, and I promptly used the touch controller to shoot them down. Looking around with the headset moved the level around, while I used the controller's trigger to fire at my enemies. The AR holograms were vivid and bright considering the sun that was pouring in the room the entire time. The headset is also light, with only the weight of an iPhone sitting on your brow. Those lenses can also easily be pulled off since they're attached via magnets. Mira tells me there'll be other lens options you can swap in if you'd like, including darker ones. So how does it work? How is Mira able to find a way to deliver augmented reality in a small, light and mobile package? It's literally one of the oldest tricks in the book, the Pepper's Ghost effect. The iPhone displays stereoscopic images, kind of like it does for Google Cardboard. The lens then has a special film on it that reflects that image in a way that makes it look like it's layered on top of the world in front of you. The second demo used Mira's markers, which we placed down on a table. When I looked at the table, Mira's app used the iPhone's front-facing camera to identify the marker and placed an overlay of a maze on top of it. I then played a quick game as a rolling donut collecting collectables and exiting the maze. It turns out that wasn't just a solo experience, as co-founder and CEO Ben Taft threw on a Prism of his own and we were able to play a quick game together, looking at the same exact overlay on the marker. And Mira's app also has a spectator mode, so co-founder and COO Matt Stern was able to pull out his iPhone and watch us play our game. The lenses on the Prism don't block out what you're seeing for other people. So when someone is looking at you, they can see that iPhone's display. Mira was simply an answer to the biggest problem AR has right now: it's too expensive. The team wanted to buy a HoloLens for development, but they couldn't afford it, so they decided to make their own. They sourced Android spec phones from China and bought components from Alibaba to build makeshift HoloLens headsets. Thousands of iterations later, they came up with a prototype that helped the company get funded. With that money they partnered up with Astro Design, the same team that designed the Xbox 360 and Nike FuelBand (RIP), to give the Prism its final form. That form is bursting with potential. It's hard not to imagine third parties getting extremely excited about leveraging smartphone AR in a more convenient wearable experience (because really, holding up your phone or tablet gets tiring). However, Mira is still figuring this part out. The team has funded and created its own AR content, but is also already working with select unnamed third-party developers to create unique content, Stern says. VR v AR: Which is the future? In fact, that's why the Prism will head to developers first this autumn before being available for consumers during the holidays this year (something we're seeing many AR players do). Mira wants to be able to build up an ecosystem of AR content by getting its device, and Unity-based SDK, in as many developer hands as possible. Most of the first pieces of content will be focused on gaming, as Mira believes it's the easiest way for people to get into and understand Prism and AR. How that third-party content will be delivered is also up in the air. While Mira wants to offer all of these experiences within its app, it also doesn't want to break any of Apple's App Store rules, which usually forbids creating any kind of store experience within an app. However, Mira isn't opposed to using a Google Cardboard or Gear VR approach, in which developers can just release their Prism-compatible apps within the App Store with a badge to identify it as Prism-compatible. Speaking of the App Store, the Prism only works with the iPhone 6, 6s and 7 right now. Taft and Stern say the company wanted to focus on one device with the same measurements and capabilities before branching out to the iPhone Plus models and Android. It also arrives at an opportune moment, as Taft sees ARKit as a means of getting more people interested in AR headsets. "With ARKit and all these awesome handheld tools being introduced, people are just gonna start getting used to AR on this level," he said. "But a big subset of that population is going to want a more premium experience, and a more hands-free immersive experience." That's why a cross-platform approach, where people using Prism headsets and spectators using their phones can participate together, is important to Mira. In fact, Taft says the Nintendo Switch of all things was an inspiration. 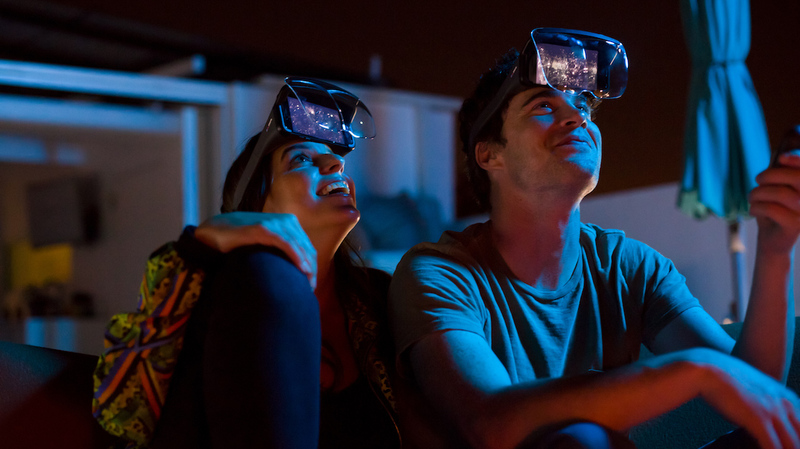 It wants people to be able to go out and have an AR experience that's not necessarily tied to a headset, because Mira doesn't believe people are ready to wear AR headsets out in public yet. But then they can come back home, put on the headset and get a more immersive experience. Hardware-wise, Mira is ready to go. The first units come off the production line next month, and Stern says the company will be able to mass produce the Prism due to it being built around a smartphone rather than building a tech-filled AR headset (therefore avoiding some of the challenges in building for AR). The big question for the Mira, and the Prism, is how much content it can build out and whether it can get big third-party developers on board, turning the Prism into the wearable AR gateway drug it so wants to be.